After nights of not being able to sleep, do your eyes ever feel tired during the next day? 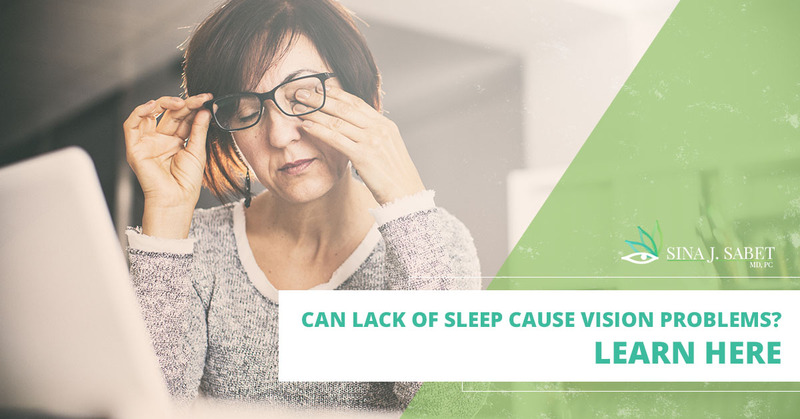 A lack of sleep can affect us in a variety of ways, including a weakened immune system, it can cause us to gain weight, it can affect our mood, cause memory issues, and as you can feel the next day, it can affect your eyes. If you want to protect your eyes, get a full night’s sleep and visit an ophthalmologist to ensure that your eyes are healthy. Researchers are still looking into what our body is doing while we sleep, but one thing that we do know is that getting at least five hours of sleep each night will help our eyes replenish themselves. If we’re using our phones to check email, scrolling through our social media pages, or watching TV, photons from the screen are hitting our eyes and it tells the body to not release melatonin. Melatonin is the chemical that tells our bodies it’s time to go to sleep. So, if you’re watching a movie right up until bedtime, it takes your body longer to adjust and to finally be ready to actually fall asleep. When it comes to our eyes, sleep is incredibly important. During the seven to nine hours of sleep that is recommended, active neurons in the body are given a chance to rest. When these neurons are resting, supportive cells, called glial cells, clean up any toxins that the neurons produced. Without the necessary amount of sleep, the toxins remain in the body. Without the proper amount of sleep, our bodies don’t focus as well, there is a lack of attention, it’s harder to work through problems, and the body has a harder time regulating insulin, which can affect the metabolism, leading to weight gain. After extended periods of a lack of sleep, you may experience twitchy eyes, eye strain, or dry eye. To help your body get a full night’s sleep, try to shut off your phones and turn the TV off at least an hour before going to bed. If you’re able, use a device that has a Night Shift, which reduces the amount of blue light that is emitted from the screen. You may sleep just fine with your contacts in, but they can affect the health of your eyes so it’s better to just take them out. Your eyes get oxygen through the surface, but when contacts are in, they are blocking the air from reaching the eyes. Some newer lenses are made to allow more oxygen to the eye, but it’s still recommended that you remove them before going to sleep. Another benefit of taking contacts out is to prevent bacteria from growing on the lens. Along with getting a full night’s sleep and taking your contacts out before bedtime, it’s also incredibly important to schedule a regular appointment with an eye doctor. Even if you don’t have any eye issues, you should still get an eye exam done at least every two years. If are you experiencing eye pain or a change in vision, contact Dr. Sina and his team of optometrists. Dr. Sina is an experienced and compassionate ophthalmologist in Alexandria who wants you to be as healthy as possible! And that can start tonight when you get a great night’s sleep.